Citizens are becoming increasingly aware of and concerned with corruption as one of the most salient challenges facing our country. 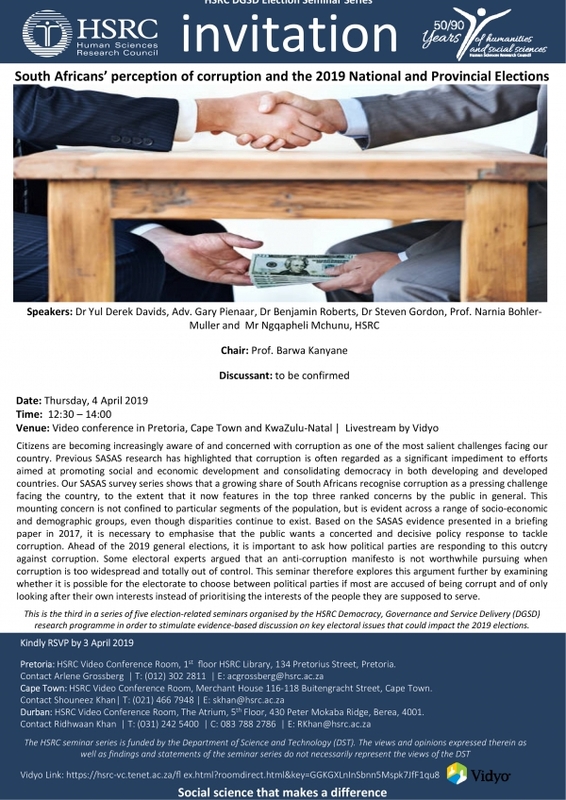 Previous SASAS research has highlighted that corruption is often regarded as a significant impediment to efforts aimed at promoting social and economic development and consolidating democracy in both developing and developed countries. Our SASAS survey series shows that a growing share of South Africans recognise corruption as a pressing challenge facing the country, to the extent that it now features in the top three ranked concerns by the public in general. This mounting concern is not confined to particular segments of the population, but is evident across a range of socio-economic and demographic groups, even though disparities continue to exist. Based on the SASAS evidence presented in a briefing paper in 2017, it is necessary to emphasise that the public wants a concerted and decisive policy response to tackle corruption. Ahead of the 2019 general elections, it is important to ask how political parties are responding to this outcry against corruption. Some electoral experts argued that an anti-corruption manifesto is not worthwhile pursuing when corruption is too widespread and totally out of control. This seminar therefore explores this argument further by examining whether it is possible for the electorate to choose between political parties if most are accused of being corrupt and of only looking after their own interests instead of prioritising the interests of the people they are supposed to serve. This is the third in a series of five election-related seminars organised by the HSRC Democracy, Governance and Service Delivery (DGSD) research programme in order to stimulate evidence-based discussion on key electoral issues that could impact the 2019 elections.